popular with the 18-35s and young at heart markets who want a relaxed small group sailing and snorkelling experience. 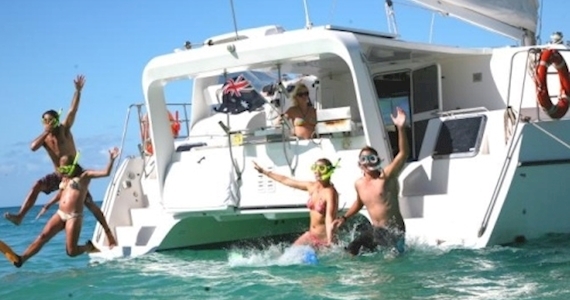 With a maximum of 12 guests, Adventurer offers a 2 day 2 night Catamaran tour around the Whitsunday Islands. This tour is most popular with the 18-35s and young at heart markets who want a relaxed small group sailing and snorkelling experience. Adventurer is a modern and comfortable purpose built charter yacht launched in 2010. Tours of the Whitsunday Islands offer time to explore the islands, including time to relax at the magificient Whitehaven Beach, walk to Hill Inlet Lookout and experience snorkelling stops on the fringing coral reefs which extend right from the edge of the Islands. The Captain and crew will provide interpretive information on the Whitsunday Islands and the Marine Park. easy water access with steps on back. Accommodation aboard Adventurer consists of open share Singles, or Private Double Cabins. Two of the Private Double Cabins also have a single bed in them, so the cabin can be used as a private twin. The Open Double is made available by dropping the table in saloon to make a double.